There’s a spectacular show going on in Ontario at the moment. It’s called fall and it happens every year. You should check it out. Ontario’s deciduous forests undergo quite a drastic change around this time of year. We say celebrate the colourful leafy alterations by going out for a rip in your Lexus–heated seats activated, moonroof open to let in the cool fall air. Yeah, now there’s a Sunday we can get behind. We’ve rounded up a few of our favourite routes and destinations to take in the wonder that is Ontario in Autumn. 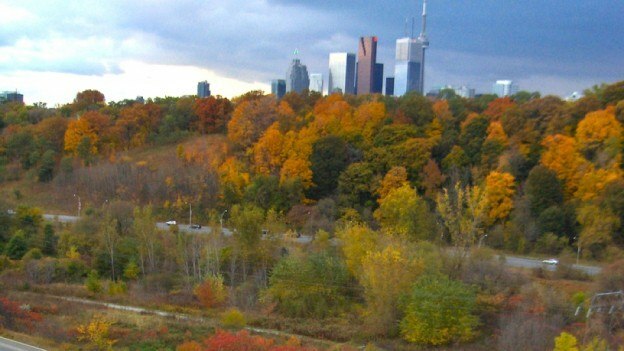 Many know the DVP solely as a time-sucking commuter route, but if you’ve ever had the chance to look around and enjoy the scenery, you’ll have noticed that it’s also darn beautiful. It’s actually a great little drive, pretty much right in the heart of Toronto. The dense forests and river valley on the sides, along with the sloping, gentle turns of the road, make this one of the best routes to take in the fall. Niagara-on-the-Lake is a busy place for good reason–it’s absolutely stunning. It’s also a great place to stretch your Lexus’ legs while taking in some natural fall beauty. Shoot out to the Loveliest Town in Canada on the highway in the morning, brunch in the town centre, and then tour through the vineyards to take in the breathtaking vistas of the transforming trees and vines. Prince Edward County, aka the new kid in cottage town, is a full of beaches, great restaurants, boutique hotels, and tree-lined roads for you to prefer. And the fall, when all the kids are back in school, is the perfect time to visit. Cruise along the lakefront and fill your phone with images of the trees and lake. Hamilton is a bonafide natural asset. With the escarpment cutting across it, the Hammer is the waterfall capital of Canada, and on fine place to explore in the fall months. Take the Lexus out through Hamilton and tour through the picturesque little town of Ancaster. Stop at the Tiffany Falls Conservation Area, which is just a 400 m walk to the falls, with every step along the meandering little river as beautiful as the one before. If yours is a camping family, gear up and stay the weekend at Ivy Lea Campground in the 1,000 Islands. They’ve got amazing spots right on the St Lawrence River, with a couple of cute towns (Brockville and Ganonque) to visit and shop nearby. Make sure to bring your passport, because there’s an amazing tour of Boldt Castle you can take by boat on the American side.